I am in love. 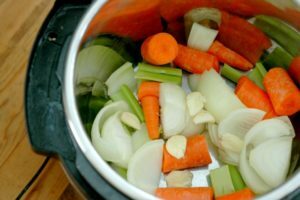 If you are not familiar with an Instant Pot or the magic it possesses PLEASE keep reading. I have had my world changed with cooking in this little piece of heaven. I say this overall dramatic statement for two reasons. 1. Complete meal ready in 40 minutes. 2. You can do almost ANYTHING in this thing. I have so far used my Instant Pot to cook pork tenderloin, sweet potatoes, rice, soup, and stew. I am excited to try a recent recipe of Mac and Cheese or even hard-boiled eggs. Seriously, the list of things you can do with it is amazing, just check out Pinterest, subject Instant pot recipes. I am a basic cook. I enjoy food and cooking food, but sometimes really enjoy a fast and easy meal. The Instant Pot has made making dinner as painless as possible. The more I cook and meal plan for the week, the more I appreciate the right tools and how they can turn a very complicated endeavor and frustrated chef into a planned and prepped kitchen queen. Last night I pulled into my driveway and knew chicken soup was the only dinner to have with our first thunderstorm of the season. I pulled out my Instant Pot and went digging for ingredients in my refrigerator. I pulled a package of frozen chicken from the freezer, chopped an onion (about ½ cups), a bundle of celery (6 stalks), 6 garlic cloves and 2 cups of baby carrots and threw it all in the Instant Pot. I set it to Stew, added 2 cups of low-salt chicken broth, 1 cup of dried lentils and put the lid on. Within 40 minutes I was enjoying homemade chicken soup from a previously completely frozen package of chicken thanks to the beautify of an electric pressure cooker. A perfect tool for a perfectly basic cook.